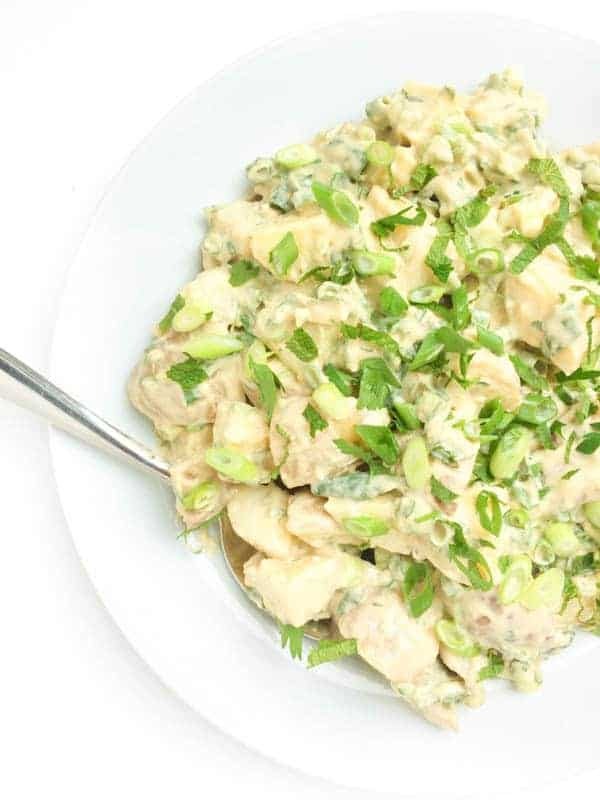 My Aunt Paula’s famous “bacon-in-every-bite” potato salad recipe, your friends and family will be begging you to make this addictive side dish again and again! 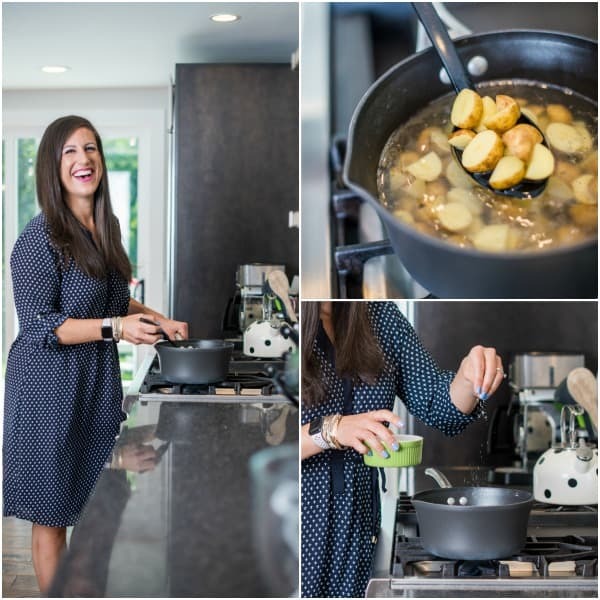 After years of requests, I am so happy to finally share my Aunt Paula’s infamous “bacon-in-every-bite” potato salad recipe! 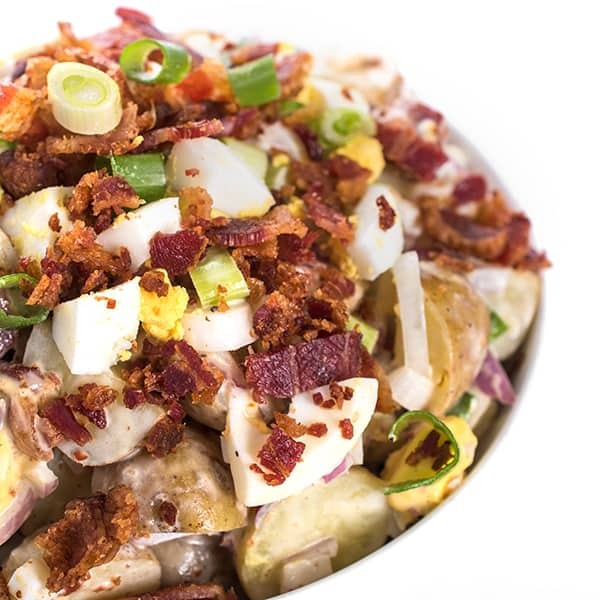 This addictive potato salad recipe has it all: crispy bacon, hard-boiled eggs, crunchy red onions and a sweet and tangy dressing. 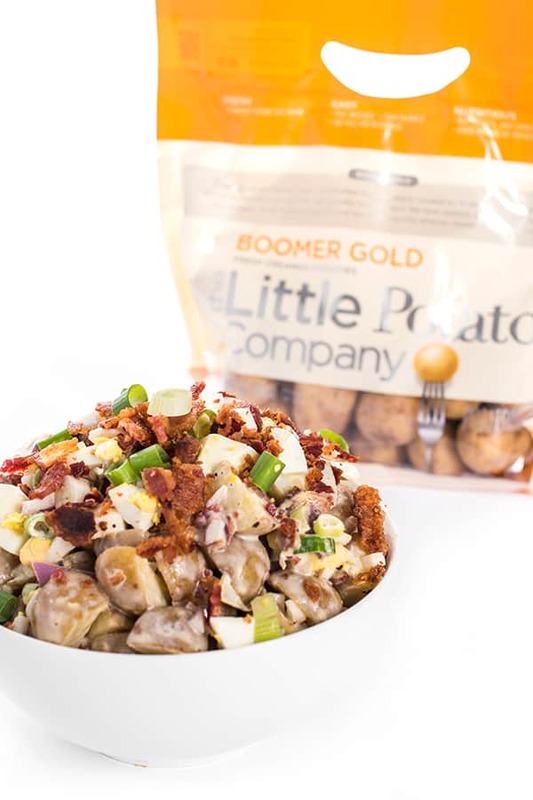 To make this potato salad even more special, I used The Little Potato Company’s Boomer Gold variety known for its delicate golden skin, velvety flesh, and naturally buttery flavor. What’s even better is that the potatoes come pre-washed and pre-peeled so I can get right to cooking when I get in my kitchen! While this is optional, I like to add a pinch of Kosher salt when I’m boiling the potatoes. This results in a more developed flavor than if I were to just add the salt at the end. 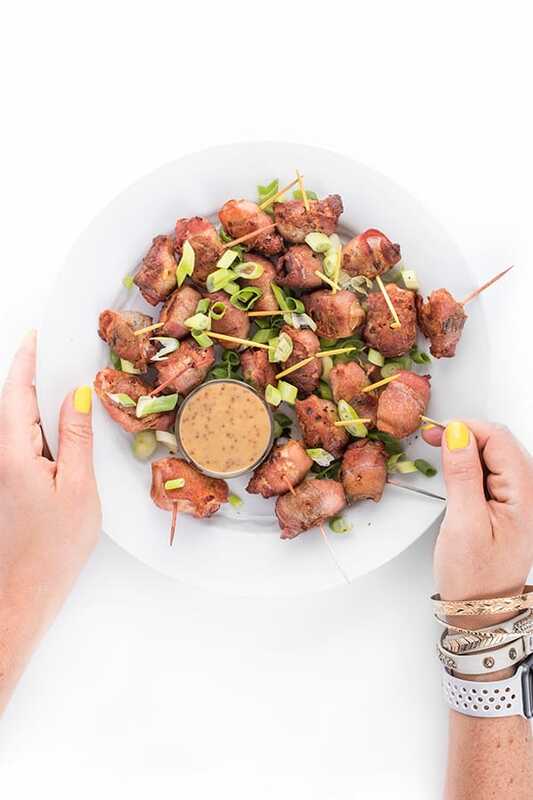 Smoky bacon balances perfectly with the simple dressing made with pantry staples like mayo, mustard, sugar and vinegar. This dish can be served warm, room temp or chilled – whichever you prefer. Ideal for feeding a crowd, it’s always the first dish to go at every family gathering, potluck or party. My Aunt Paula's famous "bacon-in-every-bite" potato salad recipe, your friends will be begging you to make this addictive side dish again and again! Pre-heat oven to 400 degrees. Place bacon slices in a single layer on a cooling rack placed inside a baking sheet. 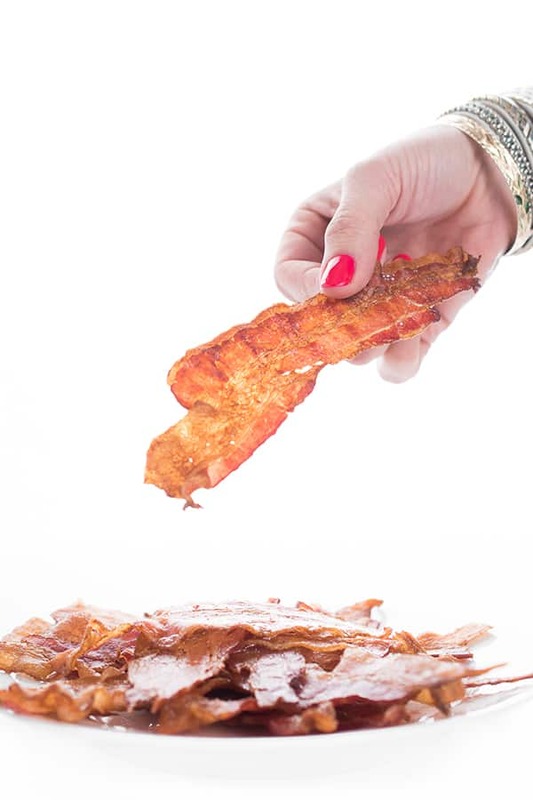 If you don't have a cooling rack, simply line the baking sheet with foil before placing bacon on top. Bake until bacon is crispy, around 15 minutes. While bacon is baking, cook the potatoes by placing them in a pan then covering with cold water. Boil until fork tender, about 12-15 minutes. Strain and set aside. Follow this tutorial to hard boil the eggs to your desired doneness. Let eggs cool enough to peel then chop into bite-sized pieces. Place cooked potatoes in a large bowl along with diced, cooked eggs. Remove bacon from oven and chop into small pieces. Add to the bowl along with the potatoes and eggs. 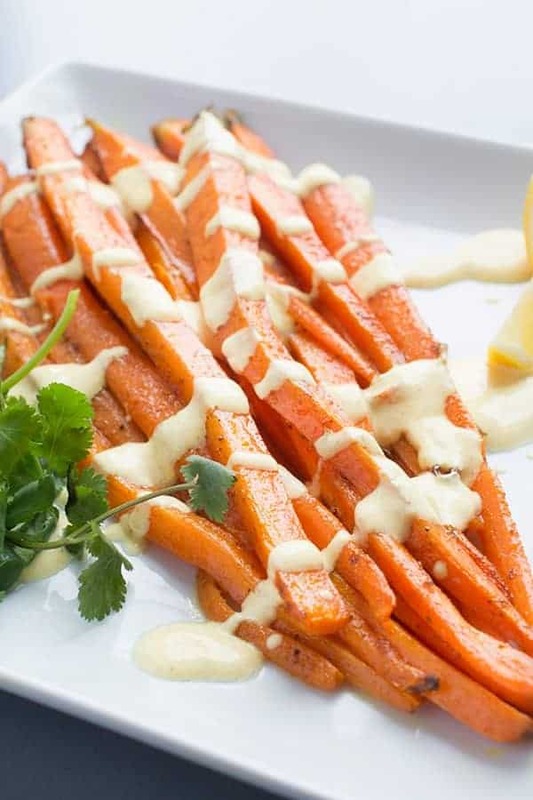 In a medium bowl, whisk together dressing: mayo, vinegar, mustard, sugar, salt and pepper. Drizzle dressing over the potatoes, bacon and eggs then toss to coat. Sprinkle in scallions before serving. Can be served warm, room temperature or chilled. Want more satisfying salad recipes? Head on over to my Pinterest board! How to make literally EVERYTHING better? Add bacon! This looks like a potato salad I would definitely devour! Sounds like a great summer side dish. I love bacon in my potato salads! Uh, this looks amazing – bacon in every bite is a challenge I would like to accept! Also, I love your kettle (and have the same one!). WHOA. This is not my grandma’s potato salad! SOOOO good with all that bacon…totally love it! 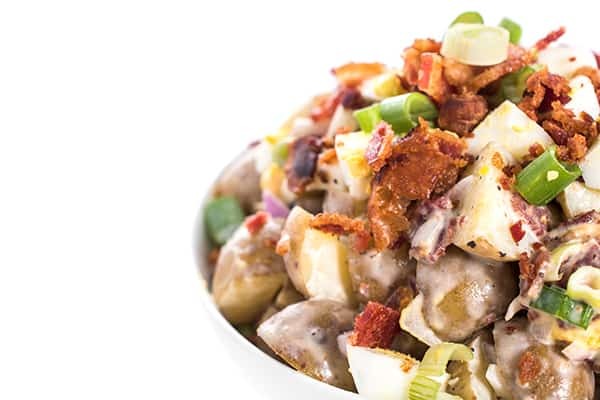 Aunt Paula knew what she was doing when she created this amazing “bacon in very bite” potato salad! Oh yum! Potato salad is THE best! I love that you load yours up with bacon, so yummy! The eggs add that great texture and a protein boost too. So perfect for summertime. 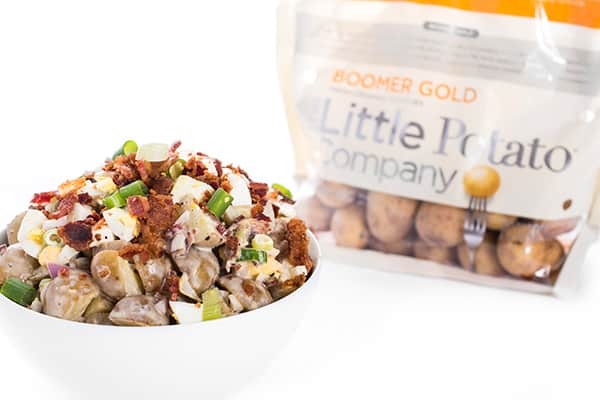 Love how you elevated potato salad with bacon, Liz! Looks so yummy and you had me at the BACON! 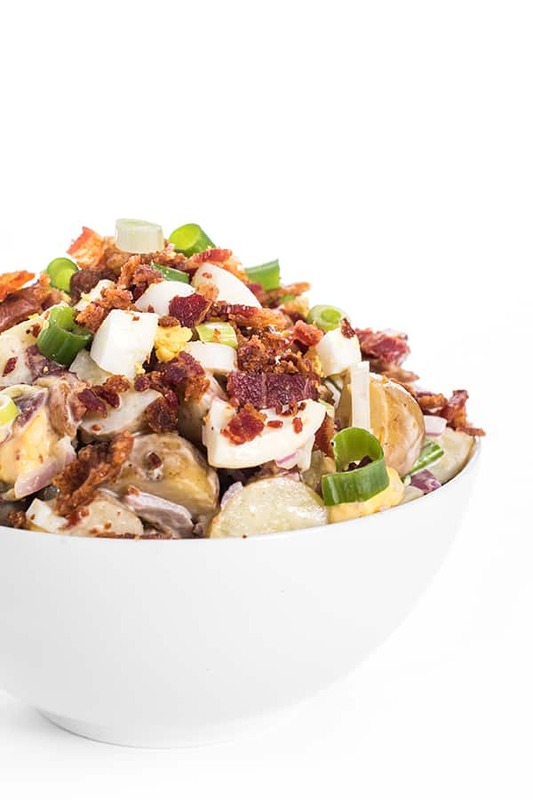 I personally love everything bacon , but when it’s with potatoes and eggs in the salad … yum! Delicious ! This looks like an amazing summer staple salad! I just LOVE “Little Potatoes.” They’re so convenient and such great quality! Bacon, I love it! Saving this for our next party! Seriously isn’t bacon the best?! I LOVE all those crispy pieces of bacon in there! And my favorite is the larger chunks of potato – I love that in a potato salad! Thanks for the great recipe! haha thank you so much! Enjoy! Oh my goodness, this is potato salad on a whole new level! And is it wrong that I really want this for breakfast!?! Right?? Thank you so much! Enjoy! Potato salad has a special place in my heart. I love your version! haha same here!! Thank you! What a fabulous combination of ingredients!! And I love the dijon in there! Gives it a nice kick! Love me some potato salad, I love the bacon addition too! This is definitely a loaded salad and has may name all over it! Looks so delicious and I love that you added bacon – YUM. This is the perfect summer side! Love that bacon and the eggs with the potatoes. One of my favorite foods in life is potato salad with eggs. This bacon version is perfection! Awww thank you sweet friend! I miss you already!